Everest Poker - Reach The Summit with Everest! Their focus on providing service in an enormous number of languages makes the client a premier destination for many poker fans across the globe but in concentrating on this aspect there is something of a double-edged sword in the overall offerings of the site. While the main page is laid out in a convenient, functional and fairly attractive manner the variety in table play itself falters in comparison. The aesthetics are all sound and players are able to use relatively high-quality avatars during games but there is a marked lack of variety in poker styles represented. Everest Poker only hosts Omaha and Texas Hold ‘Em which leaves Stud and Draw players out from enjoying the virtual rooms. Plans have been announced toward increasing the level of diversity here but for now the software isn’t much more than a pretty face which performs smoothly enough during what styles are available. Tournaments are on the smaller-side but players who don’t feel the need to make big risks will be happy with the schedule and opportunities to compete in the Everest Poker European Championship. There are frequent events to get into and the variety of game length (from sit and goes to longer play) is excellent. Turbo and speed tournaments make for a lot of loose and exciting fun but as mentioned before, not a lot of money can be gambled on here. Just the same, Everest Poker succeeds in being a great destination for low-stakes players and their emphasis on diverse tournament styles leads to a lot of fun. A player’s first deposit has an additional $100 of chips added to it and if this is done within a week of registration Everest Poker provides entry to their New Depositors $1,000 Freeroll. Loyalty is ensured through the Summit Points Program which is an experienced-based ladder system similar to the ordering of many comp point systems found elsewhere. The rates are good here and points are handed out frequently for raking hands or just entering into tournaments. Everest offers a referral system which gives the user a $50 bonus once their friends have made their preliminary deposit. Aside from these there are quite a few outstanding incentives that make Everest Poker an impressive competitor in terms of promotional funding. There is a good emphasis placed on nurturing novice players which is essential given the low-stakes focus that Everest Poker has chosen to take. Poker schools and glossaries are all well-written and easy to find which make it possible for an inexperienced user to learn and practice their way up into the ranks of other skilled competitors. The basic information is enough that the clueless will be able to teach themselves but the tips and tricks section make good reading for those who have progressed past the beginner status. Free play is also provided which furthers the fact that new players are welcomed at Everest Poker. Customer care is great and is accented by the stress on providing for an international user base. The aforementioned linguistic support is fantastic, standing heads and tails above other online poker clients. Although all funds must be converted to American dollars the banking is otherwise great for users who don’t mind having to play in possibly foreign denominations. Security is excellent and the online help form is one of the best customer service programs available. Aside from this feature there is also live support by staff members fluent in sixteen different languages. The form option is a great idea however as it is extremely comprehensive and can be displayed in any dialect selected from the top of the homepage. Although many potential users may be turned off by the lack of high-stakes play at Everest Poker others may find that it’s the perfect fit for their style of gambling. The international focus of the site is the most significant feature to stress when recommending the service and for players who have been longing to find a site which accommodates their native tongue Everest Poker will no doubt stand out as the best destination available. Even for the more thoroughly provided for English-speakers, the quality tutorials, great tournament scheduling and robust promotional options may be enough to win them over toward registration at Everest Poker. 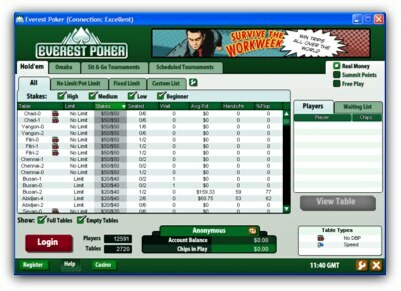 Everest Poker software is powered by Grand Virtual. 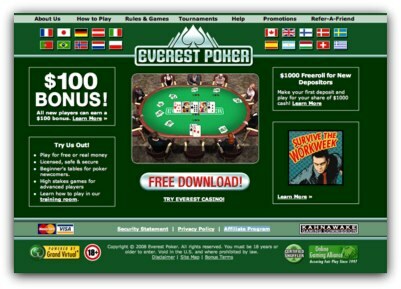 The software offers multiple configuration options as well as high class graphics and gameplay that you would expect from a trusted brand such as Everest Poker. 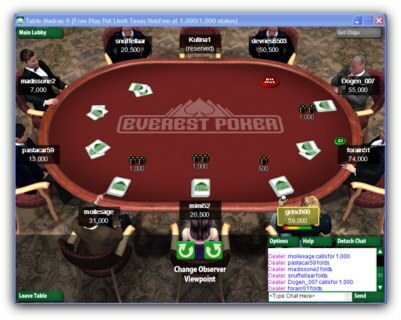 Everest Poker carry out their support via an on line FAQ and contact form. They do not provide an email address or contact telehpone number. YOu go through a series of questions online, and from the Poker Client that tries to answer the problem for you. If an answer is not obtained, you fill in your contact details and a member of the Everest Poker staff will contact you with a resolution. The following deposit and withdrawal options are avalable at Everest Poker.